There's nothing more satisfying than when the high street delivers a winning look that ticks both the fashion-forward and affordable boxes in one go. This week it's Mango's turn to claim the cult spotlight, thanks to its seriously expensive-looking skirt suit. Made up of a long-line boxy blazer and matching belted miniskirt, we've seen countless influencers and celebrities styling this chic two-piece in a variety of ways. 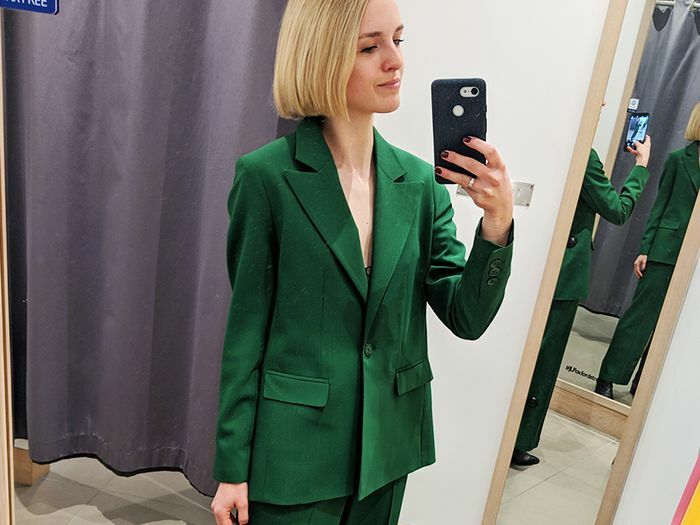 While some have opted for the traditional matchy-matchy look, others have snapped themselves in just the blazer, paired with everything from jeans to midi dresses—evidence of the suit's sheer versatility. We'll be wearing ours with a skinny knit, low-denier tights and loafers while it's still a little chilly, and then a white tee and sandals for summer. The best part of all of this? Mango's sellout suit is now on sale, so make sure you get it before it goes. As skirt suits are set to spike this summer, we've also found a couple of similar styles to whet your appetite, so keep scrolling to see and shop the looks we're loving. Style Notes: This is one of our fave looks, and we have so much time for the subtle '60s styling, which comes via the white boots and lemon-coloured kit. Style Notes: If you're not in the mood to wear the full suit, then make like Leandra and throw the blazer over jeans and a fair isle knit. Style Notes: Marta transforms Mango's suit into an edgy ensemble by styling it with a pair of over-the-knee red patent boots. Style Notes: Another easy way to style the blazer by itself—just pair with a colour-match midi dress. This is exactly what we need for the transitional weather. Up Next: Trust Me—I'm an Editor: What Do I Wear to My Friend's Hen Do?